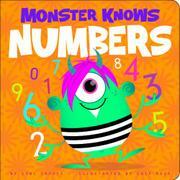 A one-eyed, pink-haired, multiarmed monster counts various toys and objects. On the very first page, the young beastie introduces readers to his messy room and all monstrous things to be enumerated. He then proceeds to count one stinky basketball shoe, two jump-rope snakes, three prickly bears and so on up to 10 sunken rubber ducks in the tub. The rhymed verse is playful and scans with a couple of minor wobbles. Wass’ highly saturated, graphic cartoons are pleasingly retro, and the monster is goofily friendly, with one fang protruding from a perpetual grin. Some numbers get a double-page spread and others just one page, but all of the spreads are busily presented with text, patterned backgrounds and a swirl of objects to count. Each numeral is presented with visual elements that match or suggest the item being counted, which works in most cases, but the barbed “3” lacks clarity for those still learning to identify these symbols.